So we’ve established that Marvel knows it has a problem with female representation in its superhero movies, and it’s probably going to make great strides in fixing that problem as soon as it possibly can. 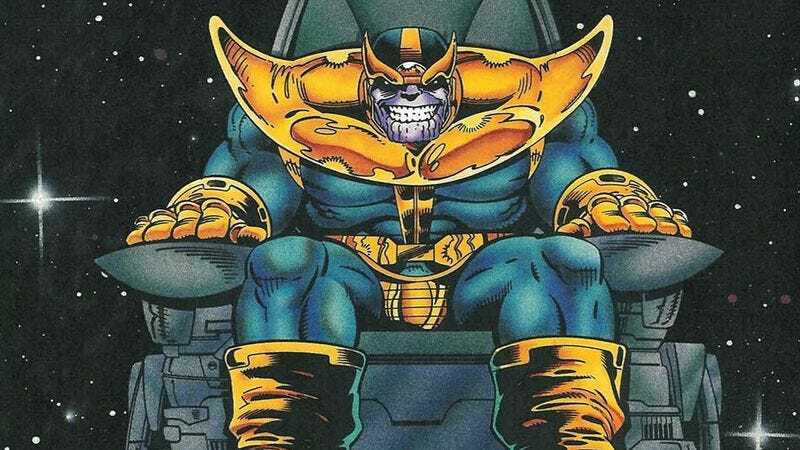 But first, check out this picture of Josh Brolin as Thanos! Ooh! Aah! Sorry, what important issue were we talking about? Hey, it’s Thanos. This is how he’s going to look in Guardians Of The Galaxy, so now you don’t need to see the movie to know what he looks like. Also, eagle-eyed readers will notice a few interesting details about this image, most notably the fact that his enormous chair has tiny little rocket engines. Where does one buy a chair like that? Do the little rockets require fuel? Is the chair comfortable? Or, if not, does it make him a more intimidating villain if his chair isn’t comfortable?